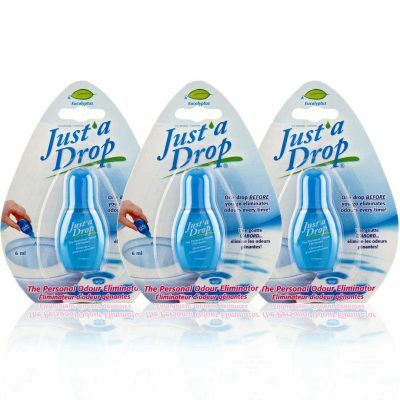 Just'a Drop Toilet Drops - Stop poop smell before you go! Just a drop BEFORE YOU GO stops toilet odours every time! Just’a Drop bathroom odour eliminator is new and better way to eliminate personal bathroom odours that occur. One or two drops of this natural plant extract in the toilet, before you go, forms a film on the water surface that traps and eliminates embarrassing odours before they escape into the air. All you’ll leave behind is a fresh, light scent. A few drops, directly in the toilet bowl before you go to activate Just’a Drop’s Pre-Action Protection Technology. With Just’a Drop natural plant extract, you can flush bad odours goodbye! All you’ll leave behind is a light, fresh scent! The clean eucalyptus scent guaranteed to stop No2 odours every time. A soft & light lavender fragrance blended with wildflowers notes.